The following is a recap of the various projects that Generosity in Action has undertaken in Burma through the assistance of a tour operator in that country. Generosity in Action through the offices of New Horizon Travel in Rangoon has successfully set up a tube-well equipped with 3HP submersible pump which is run by 23HP engine and 10kW generator (Chinese made). The construction also includes a storage tank of 3500 gallons capacity. Although the works were carried out as a fruitful project, we have been experiencing some difficulties and it took several months to finish. But the villagers much appreciate the value of the well as they do not need to go 1 to 2 miles for water under the sun and do not need to depend totally on the pond where water is available only for the rainy season. Now, Stanford GIA well stands as a source of clean water which greatly contributes not only toward health and sanitation for the village community but also toward the enhancement of their socio-economic level. 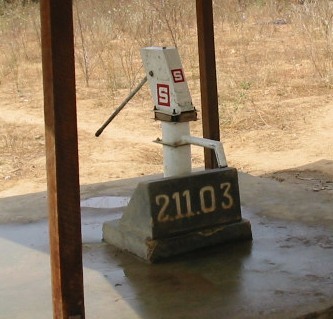 After completion of the well the villagers requested to build up an extension storage tank measuring 10' x 6' x 4' at the entrance of the village, some 650 feet from the well, and also to provide a small tank for the school adjacent to the well measuring 6' x 3' x 3', some 80 feet from the well. The two extension storage tanks have also been provided. Now difficulty lays with the operating cost. The diesel to operate the well costs US$ 80 per month. Therefore they are not able to operate the pumps on their own as you could well judge from the diesel cost per month. And hence, we have also supplied one barrel diesel (50 gals) per month which covers about 25 days of operation in a month for the past months. Now, starting from December 2003, we supply only one barrel for two months. In July 2004 we learned that in a nearby village their submersible pump was out of order and the people who rely on that tube well now come to the Thu-Htay-Kan well for water. We currently provise one barrel of diesel (50 gallons) for two months. The village charges 10 Kyat for 16 gallons (carried on shoulders with two 4 gallon drums x 2 times), and for one barrel of water (48 gallons) on a bullock cart, the charge is 30 Kyat to cover the diesel expense. With this money and the half barrel of diesel we provide each month they are able to run the well. April 12, 2005 - After two years of discussion we have been sussessful in being able to have electricity from a transformer across the street from Dhamayazika Pagoda to power the pump.The final cost for all the above was approximately US$8,300. A survey of the village was conducted that provided very positive information of the value that having the well has provided the village. Click here to read that report. As we all agreed that a project like Thuhtaykan well is basically expensive and using a generator will create a host of problems for the long term, we have set up a simpler version of a hand pump well at Thit-Htaunk-Kyun Village, located on a highway about 10 miles from Bagan. The well and the pump now are functioning well. The total for the well is about US$ 700 and the balance of US$ 100 that was provided will be used for the maintenance of the well. Donation for a new tube well in the vicinity of Bagan was approved in early 2003 and the GIA funds (US$ 800) was brought over in Nov 2003. The school and the villagers asked us to provide a tube well with compressor instead of a tube well with hand pump. The village leader and the elders assured us that from the village fund they will supply the necessary diesel and look after maintenance when it is finished. This could be done within our budget set aside for a hand pump and it was decided to aprove what the village have asked for. In the photos you will see the engine house on the left and a storage tank besides it. FYI, the capacity of the storage tank is about 700 gallons and the compressor pumps water at the rate of 420 gallons per hour. The fuel consumption is above 6 hrs. per gallon. The depth of the well is 105 feet. The villagers and especially the students are very happy to get such a tube well as it provides water for their daily needs. The total expense was US$ 700. $ 100 remains available for future projects and/or maintainence of this well..
BACKGROUND: Bagan area in the middle of Myanmar is in the dry zone. Despite the Irrawaddy flowing through the area, sources for clear water were terribly scarce. Villagers had to spend time and effort to fetch clean water from sources 1-2 miles away. Our traditional and common belief is that he who donates water to the needy will invariably reap exceptional benefits, such as personal health, prosperity, faithfulness from associates and well wishers, etc. I can imagine the grateful village folks, especially elderly women muttering words of blessing and good wishes to all involved in water well projects. The village is very poor compared to its nearby villages since most of the villagers are labourers living hand-to-mouth without any own farm. Generosity in Action agreed to provide funda for construction of a new primary school building. A report on the original proposal is available on this site. 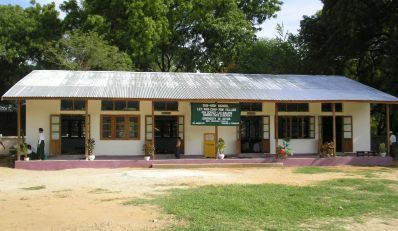 We are please to report that the school construction weas completed and dedicated in July 2004. Photos of the dedication can be seen. In March 2005 construction began on a science labratory building for the High School. The actual lab equipment is being donated by another charity but the building is being constructed with funds from Generosity in Action. The building was completed and dedicated in the summer of 2005. Click here for more information on the Hand-Over Ceremony. 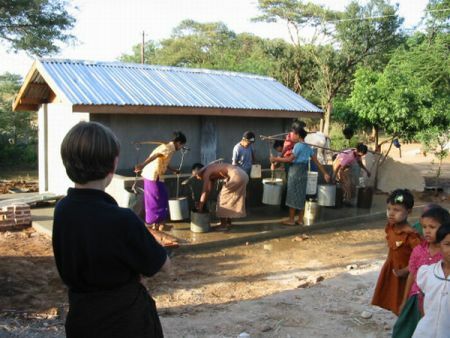 In April 2005 Generosity in Action agreed to fund construction of a tube well at the Primary School at Tha-Nat-Pyin village. The village is situated on Yangon-Bago No. 2 Highway and 30 miles northeast of Yangon City. Although it is quite close to Yangon, it is a remote and poor village. Our agent in Yangon (Rangoon) met the school teacher on his return from Bago (teachers usually hitch-hike to Yangon) and was told that the school doesn't have any water supply. The source they get water is from the village pond which is 50 metres away from school. The school boys and girls have to go and fetch the water for everyday use. Sadly he found out that the water from the pond is not pure and unfit to drink. The teachers and the villagers told him that they wish to dig a tube well in the school compound but they do not have any funds. Generosity in Action will fund construction of a tube well with hand pum plus a brick layer with GI sheet roofing. We shall have to undertake the digging work asap as we need to dig before the monsoon comes next month. The digging will be done manually to a depth of about 200 feet. This is a photo of the school which not in session at the time the picture was taken. 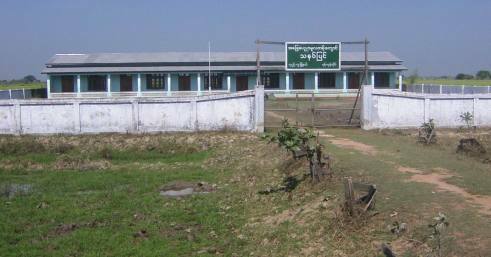 An elementary school building for the Wah-Ghin-Gyi sub-middle school and a Primary School in the Pyae Bwe Village are likely the next projects to be taken on in Burma. Both are in the Bagan area of the country.